↑ dis-NOH-mee-ə or dys-NOH-mee-ə. The former is the normal mythological pronunciation, the latter is used by Brown. ↑ ၂.၀ ၂.၁ Dysnomia's brightness is 1/500 of Eris in the visible band. With H = −1.19 for Eris, this gives H ≈ 5.6 for Dysnomia. ↑ ၁.၀ ၁.၁ "Satellites of the Largest Kuiper Belt Objects" (2006). Astrophysical Journal Letters 639 (1): L43. doi:10.1086/501524. Bibcode: 2006ApJ...639L..43B. Retrieved on 2011-10-19. 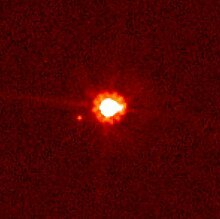 ↑ ၂.၀ ၂.၁ "The Mass of Dwarf Planet Eris" (2007). Science 316 (5831). doi:10.1126/science.1139415. PMID 17569855. Bibcode: 2007Sci...316.1585B. ↑ ၃.၀ ၃.၁ ၃.၂ Brown, Michael E.; Butler, Bryan J. (2018). Medium-sized satellites of large Kuiper belt objects. arXiv:1801.07221 Check |arxiv= value (help). ↑ Green, D. W. E. (13 September 2006). "(134340) Pluto, (136199) Eris, and (136199) Eris I (Dysnomia)". IAU Circular 8747. Retrieved on 12 January 2012.